24 p. : col. ill. ; 13.3 cm. 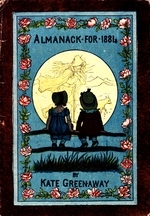 by Kate Greenaway; printed by Edmund Evans. ..,~ ~ ~ ~f "-.-......v..;..., Alit. How soon they pass away. i Tu NEW YEAR'S DAY. 17 Th Siamese Twins d., 1874. 2W Burke born, 1730. 18 F Lord Lytton died, 1873. 3 Th Jos. Wedgwood d., 1795. i9 S First English Parl., 1265. 6 S EiphLany. 22 Tu Lord Byron born, 1788. 7 M A. Ramsay died, 1757. 23 W Canon Kingsley d., 1875. 8 Tu Pr. AlbertVictor b., 1864. 24 Th Heavy Gale in Lon., '72. 9 W Fire Insurance expires. 25 F Princess Royal mar., '58..
io Th Penny Post instd., 1840. 26 S Dr. Jenner died, 1823. 11 F Rev. W. Hicks d., 1874. 27 5 3rd Sun. after Efizhkany. 12 S Temple Bar remov'd, x878. 28 M Gas first used in Lon., I807. 13 S ist Sun. after Epfihany. 29 Tu Peter the Great d., 1725. 16 W Sir J. Moore killed, 1809. 5 3. h.. d. h. m. d. h..
5 9 35 A. 0 12 3 7 A. 20 5 m23M. 28 5 1 M.
12 -,A 20 M. z 1;1. 4 M Fair on the Thames, 1814. 19 Tu Galileo born, 1564. 5 Tu Sir Robert Peel b., 1788. 20 W Hume (politician) d., 855. 7 F Pheasant shooting ends. 26 S Gelancthon born, I497 . 2 S rillat-Savarin d., i826. 1724 uexagesima Sunday. 3 5 #t Sun. after EihzhSany. 82 M Suther died, I546. 4 M Fair on the Thames, 1814. Ig Tu Galileo born, 1564. 63 W Tharles II. d., d685. 28 Th Battle ofAlumbagh, 1858. 7 Th Charles Dickens b., 1812. 29 F Geo. Washington b., 1732. 8 F Samuel Butler b., i612. 23 S Shirley Brooks died, 1874. 9S Dr, Maskelyne d., I8ii. 24 S Quinquagesima Sunday. so Z Seztuagesima Sunday. 25 M Sir Chris. Wren died, 1723..
ii M 'Lon. Bridge burnt, 1662. 26 Tu Victor Hugo born, 1802. 52 Tu Sir W. Napier d., i86o 27 W ASH WEDNESDAY. 13 W Turner (historian) d., 1847. 28 Th Corn Laws repealed, 1847. 14 Th ST. VALENTINE'S DAY. 29 F Hare Hunting ends. x d A r. W d. h. m h. n. d .
57 M. 11 4 48 19 S 18 .6 6 85 A.
r S ST. DAVID. 17 M ST. PATRICK. 2 6 Quadragesima Sunda 18 Tu Princess Louise b., 1848. 3 M Copley Fielding d., 1855 19 W Lucknow taken, r858. 4 Tu Lord Lawrence b., 1811. 20 Th Sir I. Newton d.j 1727. 5W Correggio died, 2534.. 21 F Princess Louise mar.,'71. 6 Th Rev. Samuel Parr d., 1825 22 S Goethe died, 1832. 7 F Pr'cess Wales en. Lon. 63 23 5 4th Sunday in Lent. 8 S William III. died, 1702. 24 M Eurydice foundered, 1878. 9 5 2nd Sunday in Lent. 25 Tu ANNUNCIATION DAY. io M Prince of Wales mar., '63 26 W Duke of Cambridge b., '9. ii Tu Siege of Badajoz, 181I. 27 Th Treaty-of Amiens, 1802.
i3 Th Duke of Connaught m., '79 29 S Stock Exchange panic, '18. 14 F Victor Emanuel b., 1820. ,o S 5th Sunday in Lent. 15 S Pro'essor Parks d., 1876. 31 M Peace dec rd at Paris, '6. 16 3rd Sunday in Lent. d. 9 f h d. A d. h.. m.
4 1 33 A. 11 7 4 A. 19 11 1 A. W 27 4 47 M.
I Tu ALL FOOLS' DAY. 16 W Shakespeare born, 1563. 2 W Richard Cobden d., 1865. 17 Th Benj. Franklin d., 1790. 3 Th Tower opened free, 1873. 18 F Liebig died, 1873. 4 F Oliver Goldsmith d., 1774. 19 S Lord Byron died, x824. 5 S Raikes died, ix8i. 20o Low Sunday. 6 C Palm Sunday. 21 M Duke of Sussex d., x843. 7 M Prince Leopold b., 1853. 22 Tu Wordsworth died, 1850. 8 Tu Dr. Gale died, 3702. 23 W ST. GRORGE. 9 W Lord Bacon died, x626. 24 Th Daniel de Foe died, 1731.
xo Th Battle of Toulouse, 1814. 25 F Princess Alice born, 1843.
sx F GOOD FRIDAY. 26 S Jeremy Collier d., 1726. 12 S Rodney's Victory, 1782. 27 Z 2nd Sunday after Easter. 53 Easter Sunday. 28 M Chaucer died, 1400oo. 14 M BANK HOLIDAY. 29 Tu RIqssian War ended, 1856. 15 Tu President Lincoln d., 1865. 30 W Montgomery died, x854. d. A. 0 id. M. d. A. A . 1884,] M AY. [31 DAYS. z Th Duke of Connaught b., '50. 17 S Dr. Jenner born, 1749. 2F Meyerbeer died, i864. z8 Z Rogation Sunday. 3 S Tom Hood died, I845. 19 M N. Hawthorne d., 1864. 4 3rd' Sunday after Easter. o2 Tu Duke Cambridge b., 18g9. 5 M Napoleon I. died, I821. 21 W Montrose executed, 165o. 6 Tu Sir J. Y. Simpson d., 1870. 22 Th ASCENSION DAY. 8 Th A. R. Le Sage, born, 1668. 24 S Queen Victoria born, 18z9. 9 F Fred. Schiller died, 1805. 25 5 Sunday after Ascension. 1o S Indian Mutiny com., 1857. 26 M Haydn died, 1809. 11 5 4th Sunday after Easter. 27 Tu Habeas Corpus, 2679. 12 M Strafford beheaded, 1641. 28 W William Pitt borri, 1759. 14 W Emp. Russia in Eng.,,'74. 30 F Alexander Pope d., 1744. 15 Th Daniel O'Connell d:, 1847. 31 S Canton taken, I84r. 16 F Battle of Albuera, i8ii. d.h. d. 4. M. ( M A i d .
2 M BANK HOLIDAY. 17 Tu ST. ALBAN. 3 Tu Cobden born, 1804. 18 W Battle of Waterloo, 1815. 4 W Livingstone died, 1873. 19 T C. H. Spurgeon b., 1834. S Reform Bill passed, 832. 22 ndSnday after Trinity. 8 Z Trinity Sunday. 23 M Lord Campbell died, 1861.
j M Charles Dickens d., 1870. 24 Tu ST. JOHN THE BAPTIST. o Tu Crystal Palace opn'd, i854. 25 W ist Wesleyan Conf., 1784.
. W George I. died, 1727. 26 Th George IV. died, 1830. 12 Th Corpus Christi. 27 F Earl Clarendon d., 1870. 3 F ST ANTHONY. 28 S Coronation Day, 1838. 14 S Battle of Marengo, 18oo. 29 3rd Sunday after Trinity. *S Pst Sctnday after Trinity. 30 M William Roscoe d., 183r. O M CaK d. D. 2 Tu. AST. JH m.
S8 7 4r A. i18 2 U A. 2 Th3 5 3 M. X 30 6 1583 . 1 Tu Princess Alice mar., 1862. 17 Th Dr. Isaac Watts b., 1674. 2 W Sir Robert Peel died, 1850. 18 F Dean Stanley died, 1881. 3 Th Cobden born, 1804. 19 S Bishop Wilberforce d., '73. 4 F Battle of Ulundi, 1879. 20 Z 6th Sunday after Trinity. 5 S Battle of Wagram, 1809. 21 M Robert Burns died, 1796. 6 4th Sunday after Trinity. 22 Tu Battle of Salamanca, 1812. 7 M Sheridan died, 1816. 23 W Indian Bill passed, 1858. 9 W E. Btirke died, 1797. 25 F Coleridge died, 1834.
xo Th Louis Daguerre d., 1851. 26 S Henry VII. born, 1456.
ii F Jack Cade killed, 1450. 27 Z 7th Sunday after Trinity. 12 S George Stevenson d., 1850. 28 M Marshal Mortier k., 1835. 13 S 5th Sunday after Trinity. 29 Tu Wilberforce died, 1833. 14 M Bastille taken, 1789. 30 W Gray (poet) died, 1771. 25 Tu ST. SWITHIN. 31 Th Ignatius Loyola d., 1556. 16 W B6ranger (poet) died, 1857. Sd. d... d h d. .. m. .
8 10 10 M. is 9 0 0A. 2 10 1 A. 1884.] AUGUS T. [31 DAYS. 2 S Mehemet Ali died, 1849. 18 M Earl Russell born, 1792. 4 M BANK HOLIDAY. 20 W Sir C. Sedley died, 1701. 5 Tu Lord Howe died, 1799. 21 Th William IV. born, 1765. 6 W Prince Alfred born, 1844. 22 F Battle of Bosworth, 1485. 7 Th, Queen Caroline d., 1821. 23 S Treaty of Prague, 1866. 9 S Dryden born, 1631. 25 M Herschel died, 1822. 1o 5 9th Sunday dfter Trinity. 26 Tu Prince Consort born, 1819.
ix M Lord Hill born, 1772. 27 W Thomson (poet) d., 1748. 12 Tu Grouse shooting begins. 28 Th ST. AUGUSTINE. 13 W Queen Adelaide b., 1792. 29 F General Napier d., 1853. 14 Th Bishop Law died, 1787. 30 S Sir John Ross died, 1856. 16 S Ben Jonson died, 1637. O d. h. M. d. h. m h. m. t d. m.
S11 7 A. 14 8 M 20 9 5 A. 28 8 42 A.
i M Partridge shooting begins. 16 Tu Moscow burnt, 1812. 2 Tu Capitulation at Sedan, '70. 17 W Louis XVIII. died, 1824. 3 W Oliver Cromwell d., 1658. 18 Th Hazlitt (author) d., 1830. 5 F Dr. J. Dalton born, 1766. 20 S Battle of Alrha, 1854. 7 xI3th Sunday after Trinity 22 M Theodore Hook b., 1788. 8 M Sebastopol taken, x855. 23 Tu Battle of Assaye, 1803. 9 Tu Cervantes born, 1547. 24 W Lord Hardinge d., '856. 2o W Beyrout taken, 2840. 25 Th Porson died, 2808.
ix Th Lady Palmerston d., x869. 26 F ST. CYPRIAN. 12 F Marshal Blucher d., 1z89. 27 S Brindley died, 1772. 24 5 z4th Sunday after Trinity 29 M ST. MICHAEL. 15 M Sir I. K. Brunel d., 2859. 30 Tu G. Whitefield died, 2770. Si. h. m d. d. A. d. m.
S10 0 8 19 9 37 M. ) 10 1 .
i W Sir E. Landseer d., 1873. 17 F ST. ETHELDREDA. 2 Th Frangois Arago d., 1853. 18 S Lord Palmerston d., 1865. 4S Barry Cornwell d., 1874. 20 M Grace Darling d., 1842. 5 17th Sunday after Trinity 21 Tu Battle of Trafalga, 1805. 6M Batthyani shot, 1849. 22 W Dr. Arnold died, 1822. 7 Tu Marshal Burgoyne d., '71. 23 Th Earl of Derby d., 1869. 8 W Fielding died, 1754. 24 F Joseph Lancaster d., '38. 9 Th Chicago Fire, 1871. 25 S Battle of Balaklava, 1854.
ii S Old Michaelmas Day. 27 M Servetus burnt, 1553. 22 5 i8th Sunday after Trinit) 28 Tu SS. SIMON AND JUDE. 13 M Murat shot, 1815. 29 W John Keats born, 1795. 14 Tu Fire Insurance expires. 30 Th L. Gambetta born, 1838. .5 W W. Von Kaulbach d., '74. 31 F All Hallows' Eve. 16 Th Battle of Leipsic, 1813.
h. d. h. d. h dm. . h. m.
1 0 A. 11 29 A. 19 0 31 51. 27 4 54 M. 1884.] NOVEMBER R. [30 DAYS. 2 2ist Sunday after Trinity 17 M Suez Canal opened, 1869. 4 Tu George Peabody d., 1869. 19 W Charles I. born, 16oo. SW Gunpowder Plot, 1605. 20 Th Chatterton born, 1752.
b Th Princess Charlotte d., i817. 21 F Princess Royal born, 1840. 7 F Battle of Moultan, 1848. 22 S Lord Clive died, 1774. 9 22nd Sunday after Trinity 24 M Lord Melbourne d., I848. 1o M Martin Luther born, 1483. 25 Tu ST. CATHERINE. IT T.i ST. MARTIN. 26 W W. Cowper born, 1731. I1 W R. Baxter born, 1615. 27 Th Lord Selborne born, 1812. 13 Th F. Overbeck died, 1869. 28 F Cardinal Wolsey d., 1530. 14 F Mozart born, 1719. 29 S Prince Rupert d., 1682. 15 S ohn Bright born, 1811. 30 st Sunday in Advent. O d m. d. h. 1 1d. i. .
i M Princess of Wales b.. 1844. 17 W Beethoven born, 1770. 2 Tu St. Paul's opened, 1697. 18 Th Rogers (poet) d., 1855. 6S ST. NICHOLAS.' 22 M Archbishop Tait b., 1811. 7 5 2nd Sunday in Advent. 23 Tu Prince Albert buried, 1861. 8 M Venice ceded, 1797. 24 W Thackeray died, 1863. 9 Tu Milton born, 1608. 25 Th CHRISTMAS DAY. io W Fall of Plevna, 1877. 26 F BANK HOLIDAY. ii Th Prince Cond6 died, 1686. 27 S Charles Lamb d., 1834. 12 F Lord Hood born, 1724. 28 S Sunday after Christmas. 13 S Clerkenwell Explosion, '67. 29 M W. E. Gladstone b., 1809. 14 5 3rd Sunday afterAdvent. 30 Tu R. Boyle died, 1691. 75 M Izaak Walton died, 1683. 31 W ST. SILVESTER. z6 Tu George Whitefield b., 1714.
o d. h. d. h. md. h. m d. h.m.
2'7 oA. 9 11 30 XM. 17 1i 24 A. 2 21 21A. BIRTHDAYS OF THE ROYAL FAMILY. VICTORIA, Queen................................................ M ay 24th, 1819. Prince of W ales ............................................... Nov. 9th, 1841. Princess of W ales............. ............................... Dec. ist, 1844. Prince Albert of Wales ................................... January 8th, 1864. Prince George of Wales................................. June 3rd, 1865. Princess Louise of Wales .. ............................. Feb. 26th, 1867. Princess Victoria Alexandra O. M. of Wal s ...... July 6th, 1868. Princess Maud C. M. V. of Wales .. .................. Nov. 26th, 1869. Princess Royal of Prussia ................................ Nov. 2ast, 1840. Princess Louis of Hesse ........................... April 25th, 1843. Duke of Edinburgh ......................................... August 6th, 1844. Duchess of Edinburgh ............................... ...... Oct. i7th, 1853. Princess Christian............................................. M ay 25th, 1846. Princess L. C. Alberta........................................ March i8th, 1848. Duke of Connaught.......................................... May ist, 1850. Dnke of Albany................................................... April 7th, 1853. Duchess of Albany .................. ........................ Feb. 17th, 1861. Princess Beatrice ........................................... April i4th, 1857. Duchess of Cambridge ................................. July 25th, 1797. Duke of Cambridge................................ March 26th, :819. Duchess of Mecklenburgh.................................... July 19th, 1829.
for students only. Closed entirely during October. first week in February, May, and October. October till end of February. Reading Room, free. Council Chamber, by a small fee. Museum of Antiquities, Guildhall-Daily, free. Friday, from io till dusk, free. Royal Aquarium, Westminster-Open daily, ii to ii. Admission Is. 6d. each, from io a.m. till dusk. Patent Museum free, daily. 6d. ; 20 to 4; Monday and Saturday free. March 26th.-A Partial Eclipse of the SUN, invisible at Greenwich. Atril 9-ot/h.-A Total Eclipse of the MOON, invisible at Greenwich. April 25th.-A Partial Eclipse of the SUN, invisible at Greenwich. October 4th.-A Total Eclipse of the MOON, visible at Greenwich. End of Total Phase -- - 4, o 482 at Greenwich. October .8th.-A Partial Eclipse of the SUN, invisible at Greenwich. .TRANSFER DAYS OF THE FUNDS. Sunday, then on the 7th. 3 per cent. Consols ... ... ... ... .
New 3- per cent. ... ... ... Daily. New 3 per cent. ... ... ... ... .. Daily. India Debentures Interest due. 6th February and i6th August. Hours for selling and transferring every day from II till 3 o'clock. Saturday excepted, then only till I o'clock. Dividends are payable daily from 9 till 3 o'clock. PAYMENT OF DIVIDEND BY POST. warrants will require endorsing, and are only payable through a banker. February 8th, Half-Quarter Day. August nIth, Half-Quarter Day. March 25th, Lady Day. September 29th, Michaelmas Day. May 9th, Half-Quarter Day. Nov. inth, Half-Quarter Day. June 24th, Midsummer Day. December 25th, Christmas Day. S The New Parcels Post. of postage, to be prepaid in ordinary postage stamps, will be 3d. ; ilb. Maximum length, 3ft. 6in. ; Maximum length and girth combined, 6ft. length, it may measure as much as 3ft. in girth, i.e.-around its thickest part. liquid, and Live Animals, will be excluded from the Parcels Post. 6, 4d. Thin Cards--, id. ; 2, i1d ; 3, i-d.; 4, 2i., '5,, 3d., 6. 3d. Reply Post Cards are also now issued at an advanced rate. throughout the United Kingdom is is. for the first twenty words, and 3d. addresses of the sender and- receiver are not charged for. Sums under ios. ... 2d. Sums of 6 and under 7 8d. ,, of Ios. and under 2 3'd. ,,,, 7 ,, 8 9d. S 2 ,, ': 4d. ,, ,, 8 ,, ,, 9 rod. ,, ,, 3 ,,, 4 5d. ,,,, 9,, ,, Io IId. ,, ,, 4 ,, ,, 5 6d. ,, ,, .................. Is. For is. .. ..................... ... d. For os. ...................... ..... 2d. is. 6d. .............. ... Id. ,, 6s. 6d. ....................... d.
,. s. 6d. .. .............. id. s.. ................ 2d. S7s. 6d. ................ d. I ,, 2os.......................... d.
"The above Orders will only be available for three months. And you and I are older grown. S.. .... """ ii ....:~ ... .......... -...2 ..